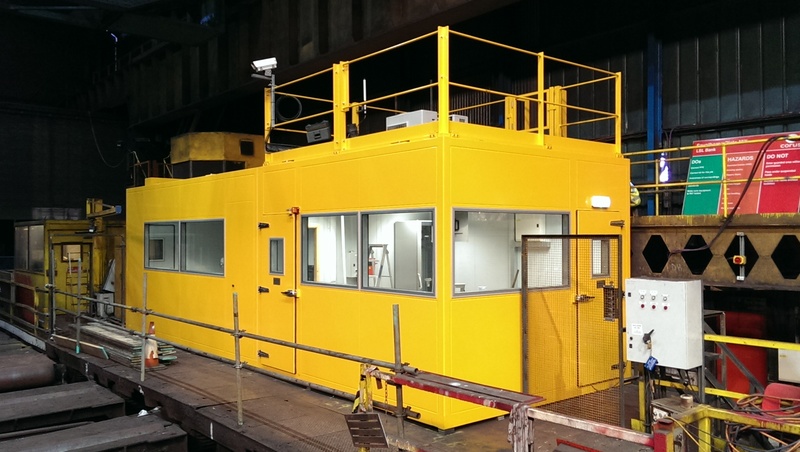 Light Shear Line Bank Control Cabin & Mess Room for a UK based plate mill operated by the Long Products Division of a world leading steel producer. To design, manufacture, deliver and install the required facility, this consisting of a Control Cabin approximately 4.1m long x 3.0m wide x 3.5m high with an adjoining Mess Room / Amenities area approximately 6.0m long x 2.3m wide x 3.0m high. & sized for ease of transportation and installation on site. lighting, mains power, data transfer, plumbing services and finished floor overlays etc. decking, stanchions, removable hand-railing etc. fan etc.) & dining area with breakfast bar & bar stool type seating. Numerous single leaf man access doors to facilitate personnel entry / egress and emergency exit. overview of the `production’ process. The construction provided a 30dB reduction from factory ambient noise levels, allowing personnel to effectively communicate in a stress-free, comfortable environment.